Opposites attract in this charming tale of unrequited love. 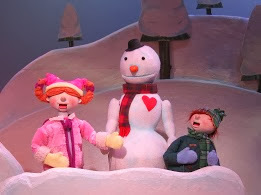 Stan the Lovesick Snowman plays at the Center for Puppetry Arts Jan. 2 – Feb. 2, 2014. Stan’s adorable story begins after a chance encounter with a dog that has been sent outside in the wintry cold. The dog tells the snowman about a warm stove inside the house, and with a “crack-crackle” in his heart, Stan falls in love with the wood-burning beauty. 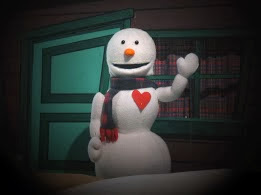 The unlikely romance, doomed from the start, is only the beginning in this hilarious and heartwarming tale as Stan later discovers that a young snowwoman is swooning over him as well. 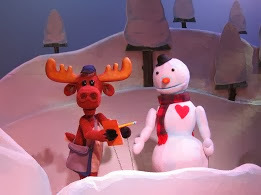 Husband and wife puppeteer-duo, Tim and Amy Sweeney, portray 13 characters in the production including Stan the Snowman, Abigail the Snowwoman, Alice the Dog, the Moose Mailman, a trouble making Cat and more. This delightful fairy tale, recommended for ages 4 and up, will melt the hearts of audiences everywhere. · Saturday: 11:00 a.m., 1:00 p.m. and 3:00 p.m. The Center for Puppetry Arts will be closed January 1 (New Year’s Day); no performances on that date. Tickets include Museum admission as well as the Create-A-Puppet Workshop (or To-Go Kit), where children can make their own Stan the Snowman rod puppet.